The GE Vivid i is compatible with five new probes, including the 5S cardiac transducer and the 9T TEE transducer for pediatric exams. 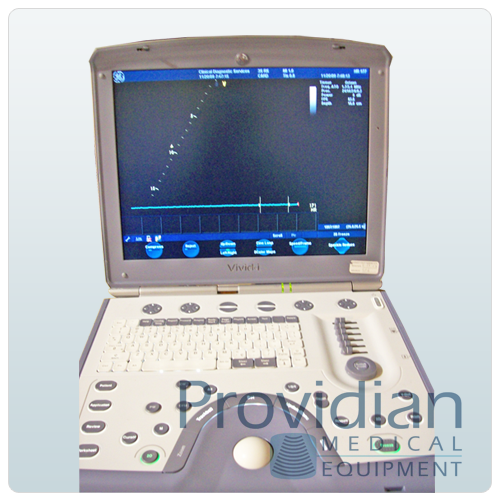 This versatility makes the Vivid i ultrasound optimal for cardiovascular, vascular, abdominal, anesthesia, musculoskeletal, general imaging, small parts, transcranial doppler, and several other applications. There’s not much we can say about the GE Vivid i that isn’t positive. It holds its value, has a great price point, is only as complicated as you want it to be. This is probably the best design of GE’s portable ultrasound machines, as it’s fairly intuitive and consistent. Doctors love its image quality for cardiac, vascular, venous, small parts, and a variety of images requiring excellent nearfield imaging as well as penetration for deep tissue or difficult-to-image patients.The GE Vivid i’s successor, the GE Vivid q portable cardiovascular ultrasound, just missed our Best Portable Ultrasounds category simply because its pricepoint makes takes it out-of-reach for some customers. However, either system will provide you with excellent image quality and all the features you’ll need out of a portable cardiac ultrasound machine. For advanced use, the Vivid i also has many imaging options for cardiologists, such as Tissue Tracking, Tissue Velocity Imaging, Blood Flow Imaging (B-Flow), TSI Tissue Syncronization Imaging, Automated Ejection-Fraction calculation, Stress Echo, Contrast Imaging, IMT Measurement Program, Quantitave Analysis Q-Analysis), LVO Contrast, and LogiqView (panoramic imaging). More recent software versions also allow for shared-services imaging option by adding an OB/GYN package.